New Holland has updated its CR rotary threshing combine range. The new CR 8.80 fits into the lower end of the six strong combine line-up, in-between the 7.90 and 8.90 models. New Stage 4 engines from Fiat Powertrain (FPT) are fitted and these do not require engine gas recirculation (EGR). 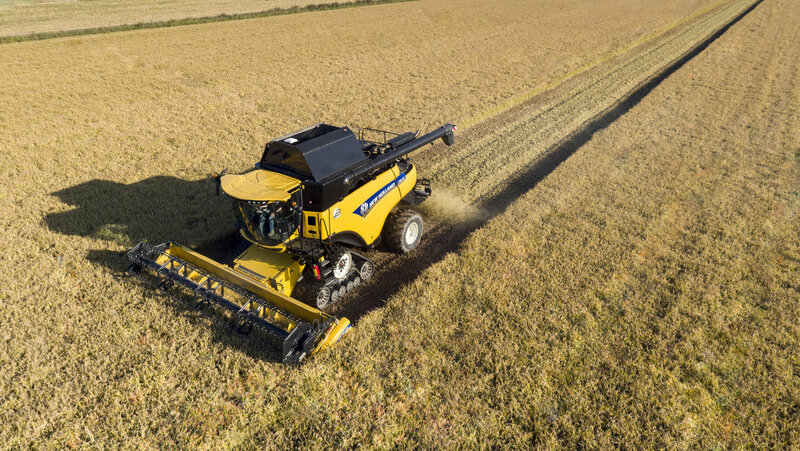 Filtered down from the larger CR models, the CR8.80 gets new adjustable vanes, the manufacturer’s Twin Pitch Rotor threshing system and Dynamic Feed Roll, which New Holland claims to create a smoother crop feed and improves feeder performance by up to 15 per cent. The manufacturer says the vanes, mounted on the top section of the threshing rotor cage, help increase grain separation and keep the crop on the rotor for longer, which it says is useful when working in damper straw conditions. When fitted with 710/70 R42 tyres or 24 inch tracks, the machine measures 3.24m wide. New Hollands claims the machine is capable of harvesting over 50 tonnes per hour, when fitted with its 9.1m Varifeed header. The machine features the manufacturers Harvest Suite Ultra cab, CommandGrip controller and IntelliView monitor. Edge guidance and auto guidance are on the options list as well. The CR 8.80 machine will debut as part of New Holland’s UK harvest demonstration tour in August and September.